Whilst Samsung are not expected to announce their new Galaxy S4 smartphone at next month’s Mobile World Congress, they are expected to unveil a smaller, 8-inch-screen tablet – the new Samsung Galaxy Note 8.0 at the Barcelona Mobile World Congress, according to a report. Now more images of Samsung’s upcoming tablet—the Galaxy Note 8.0—have popped up, Last week we saw some photos of the new Galaxy Note 8.0, and also heard some specifications about the device, and now it would appear that this new Android tablet has appeared at the FCC. Display: The Samsung Galaxy Note 8.0 will feature 8 inch Super Clear LCD display with a 1280 x 800 pixel resolution. Design: It looks like a large Galaxy S III and features thicker side bezels than Apple’s (AAPL) recently released iPad mini. Button: The tablet also features buttons like other devices in the Galaxy Note line-up, which include a Home button in the centre, with Back and Menu capacitive buttons on either side, much like other devices in the Note line-up. Dimension: The dimensions of the tablet will be 211.3X136.3X7.95 mm and it will weigh around 330g. Processor: On the processor front, it is expected that Samsung may employ the Exynos 5 Octa processor, which it announced during CES, earlier this month. The eight-core processor is based on the ARM big.LITTLE/Cortex A-15 architecture and is designed to be a low-powered, high performance mobile processor. 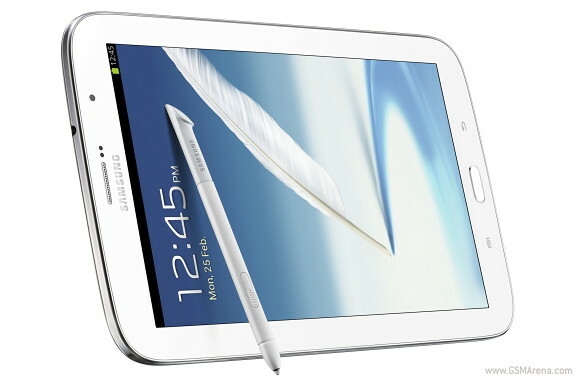 OS: The Samsung Galaxy Note 8.0 will come with Android 4.2 Jelly Bean, the most advanced operating system. Camera: The Samsung Galaxy Note 8.0 includes dual cameras, on the back of the device we have a 5 megapixel camera, and on the front of the Galaxy Note 8.0 we have a 1.3 megapixel camera. S-Pen: Now we have a new photo of the Samsung Galaxy Note 8.0, this time with Samsung’s S-Pen accessory, Samsung’s version of a high-quality pressure-sensitive stylus. Other features: The Samsung Galaxy Note 8.0 will also feature a choice of either 16GB or 32GB of built in storage, plus a microSD card slot that will take up to 32GB cards, plus A-GPS, Bluetooth 4.0, 4600mAh battery, USB 2.0 and WiFi, it will also come with mobile data connectivity in the form of HSPA+. Pricing and Availability: The device is also rumored to be priced under $300. The Note 8.0 is apparently confirmed to make a debut at the Mobile World Congress (MWC) to be held in Barcelona next month. Galaxy Tab 3 Plus: It further states that Samsung is also making efforts to bring the Android-based Galaxy Tab 3 Plus or P8200 to the market. This is the high-end tablet we reported earlier that is expected to come in 16 and 32GB variants. 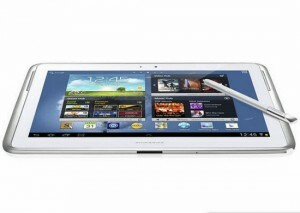 Additionally, a second generation Galaxy Note 10.1 codenamed Vienna may also be in the works. 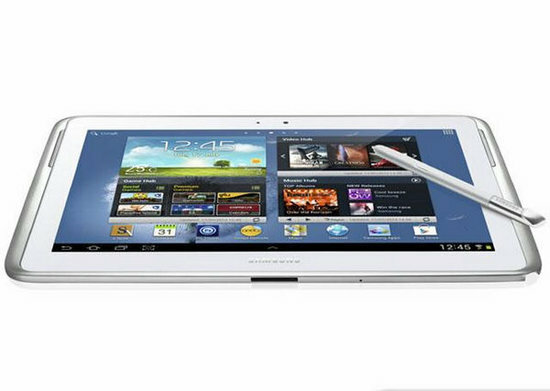 The Samsung Galaxy Note 8.0 is set to compete with the iPad mini, Nexus 7 and the 7-inch Amazon Kindle Fire HD. We should have more details about the new Samsung Galaxy Note 8.0 when it is officially announced at next month Mobile World Congress.